Andrew Burton/GettyGoPro CEO Nick Woodman. 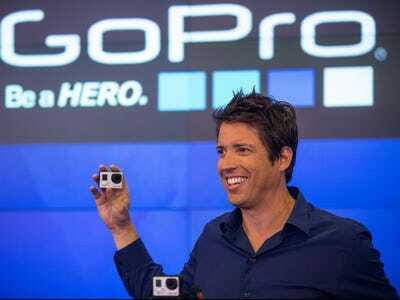 GoPro this morning filed to sell $US800 million of stock. Following this disclosure, the company’s CEO Nick Woodman sent an email to employees giving more colour on why the company is selling stock, and outlining his intentions as a GoPro shareholder. Woodman also listed the company’s two main goals with this offering: getting $US100 million of new capital for the company, and facilitating a more orderly sale of stock following the end of its lock-up expiration. After a company goes public, there is a period, typically 180 days, during which company insiders can’t sell shares. When this period ends, a bunch of new stock is eligible to hit the market, potentially leading to a decline in the share price as this new stock “dilutes the float,” or reduces potential earnings per share. Back in early October, shares of GoPro sold off after the company’s founders reached an agreement with JPMorgan to break the lock-up restriction in order to gift shares to a charitable trust. And with GoPro’s lock-up restriction set to end on December 22, it seems the company is making sure it is clear with the market regarding its plans this time around. This morning, GoPro filed documents with the Securities and Exchange Commission outlining our plans to conduct a ‘follow-on and secondary’ offering of our stock. This is a relatively common occurrence following an IPO — it allows the company to raise additional capital while providing our early investors and employees with vested options the opportunity to realise a return on their hard work and dedication to GoPro. While all permanent, full-time employees receive equity compensation, only those holding vested options and shares can participate in this particular event. First, we expect to raise approximately $US100 million of new capital for the company which will provide us with additional resources to invest in people, products, potential acquisitions, and infrastructure to help us achieve our long-term vision. Second, this offering is intended to facilitate a more orderly and gradual sale of shares than what might otherwise occur when the IPO lock-up ends on December 22. Our goal is to reduce the impact that the IPO lock-up expiration may have on our stock price. To help further this goal, larger shareholders that participate in this offering will be signing a new 90-day lock-up agreement. I plan to sell a portion of my holdings in GoPro, but no one should misunderstand my commitment to the company or our vision. As I told investors on our earnings call last week, I plan to be a significant shareholder in GoPro for a long time. I’m a huge believer in our vision and our ability to realise it. Thanks for continuing to make our vision for GoPro a reality, team. The passion, experience and execution that we bring to work is what makes all of this possible. It’s the reason why the world believes in us. I’m throwing out a huge hug, Hi5 and thank you for making GoPro the incredible company that it is.